Bookstore café owner Krissy Hancock would rather spend Halloween serving pumpkin goodies than wearing costumes with Pine Hills’ wealthiest at Yarborough mansion, especially when the soiree shapes up to be more trick than treat . . .
As if a run-in with an old flame and a failed marriage proposal weren’t enough to horrify Krissy for one night, a woman is found strangled to death in a room filled with ominous jack-o’-lanterns. All signs suggest a crime of passion—but when the hostess’s jewelry disappears, malevolent intentions seem way more likely . . .
With the estate on lockdown and a killer roaming the halls, Krissy must help Officer Paul Dalton investigate each nook, cranny, and guest for answers—while also confronting a few demons of her own. Someone has lots of skeletons in the closet, and Krissy better tread lightly to expose them . 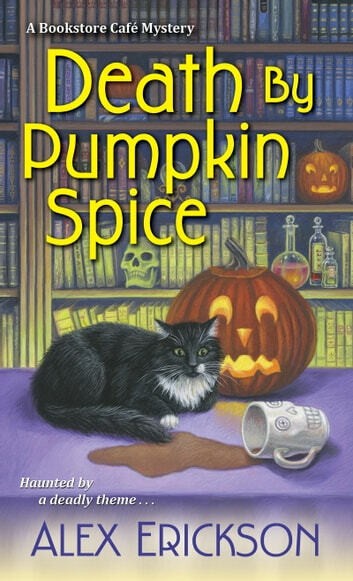 . .
Death by Pumpkin Spice by Alex Erickson is the third book in Bookstore Café Mystery series. Krissy Hancock is invited to the exclusive Yarborough Halloween Party by Dr. William Foster. Krissy purchases her costume at the local Halloween pop-up store (for a fancy, exclusive party). Krissy goes as Sherlock Holmes and Will is Phantom of the Opera. The Yarborough driveway is steep and under construction (just gravel). It is difficult for the cars to get up the driveway due to the pouring rain. The Yarborough house is unique (wait until you read the description of the kitchen). Howard Yarborough, who recently passed away, loved Halloween and the house reflects his taste (it is this way all the time). After Margaret Yarborough addresses the guests, Quentin Pebbles steps up and proposes to his girlfriend, Jessica. Jessica rejects Quentin’s proposal (she humiliates him). When the guests are invited to explore the house (each room has a different theme), Jessica is found dead in the pumpkin room. Officer Paul Dalton is the only police presence in the house and responders cannot get up the drive. Paul asks Krissy for assistance (she is thrilled to help). They are searching for Quentin (who disappeared) when Margaret states her jewels are missing. Does it have anything to do with the murder? Paul and Krissy have their work cut out for them. The guests refuse to stay in the ballroom. They keep taking off to explore the house. Krissy is also distracted by her ex-boyfriend, Robert. He showed up at the party so he could talk to Krissy. Robert wants Krissy to give him another chance (after he cheated on her). Will Paul and Krissy be able to find the killer before the guest’s mutiny and demand to be released? To find out who killed Jessica Fairweather, you will need read Death by Pumpkin Spice! I thought Death by Pumpkin Spice was disappointing. I thought Krissy was an extremely unlikeable character. Krissy has confidence issues and is constantly doubting herself (it is unappealing). Her self-doubts and lack of confidence make it really hard to enjoy the book. Krissy seems very immature. The book also focused too much on romance. Krissy is at the party with Will, but she keeps thinking about Paul (blushing when his name is mentioned, when she thinks about him). Then Robert pops up and wants her back. I also found some contradictions in the novel. She agrees to go to an exclusive party with Will. But after seeing Will’s costume, the fancy house, and the other guest’s costumes, she realizes it is a fancy dress party (she did not get that from the invite and her friends telling her how this is a very exclusive event). 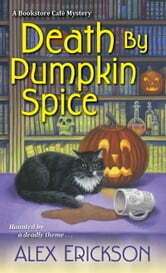 Death by Pumpkin Spice is easy to read and can be finished in a couple of hours. The mystery can be easily solved (you can solve it before you get to page 100). You only need two clues to figure it out. I give Death by Pumpkin Spice 3 out of 5 stars (it is okay). This book was just not for me. The premise is good, but I did not like the final product. The best in the series so far. This third in the series is the best so far. I'm glad I read it because I was really disappointed with the first two. Found it hard just to finish this book. Boring plot. Did not like the main character at all. Her reasoning for solving a murder and overstepping the police was just really sad and annoying. It just seemed to go on and on with her bouncing from person to person asking questions with no authority to be doing so. Sorry, but I did not like this book.